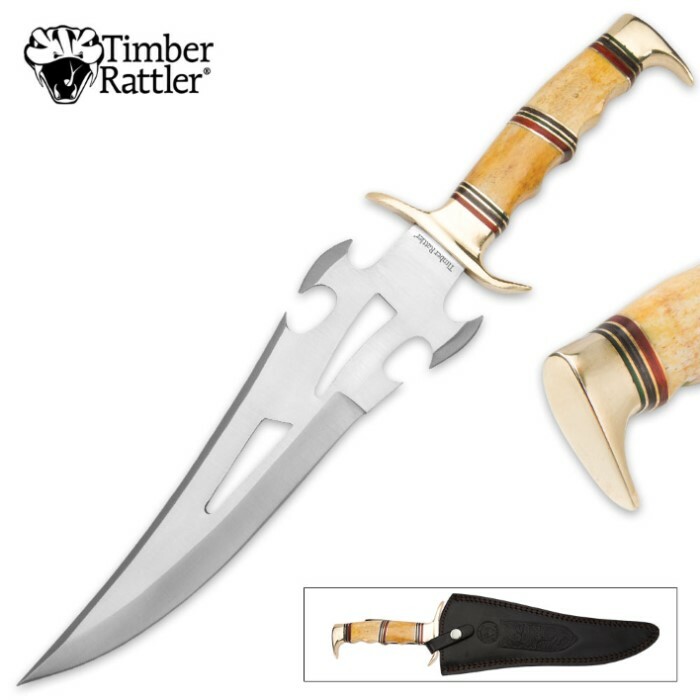 Timber Rattler Ancient Bone Fantasy Fixed Blade Knife with Leather Sheath | BUDK.com - Knives & Swords At The Lowest Prices! 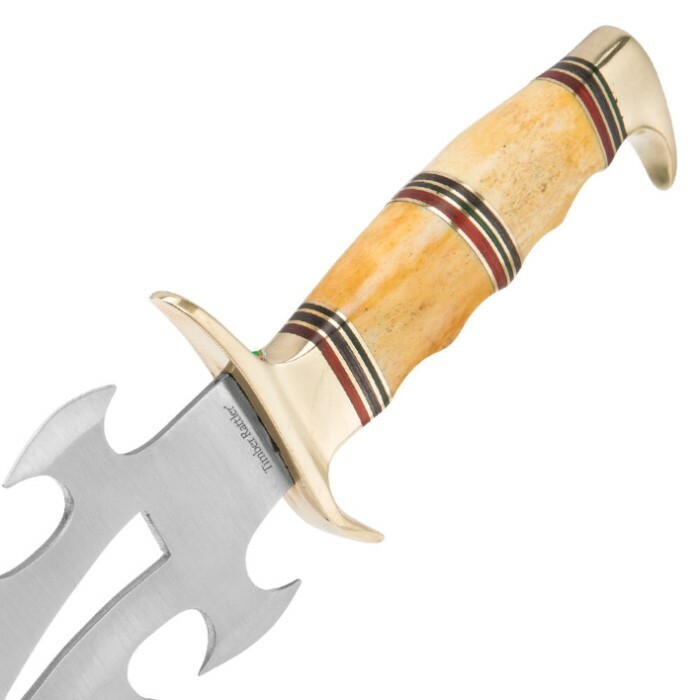 Dazzling on display and powerful in the field, Timber Rattler's Ancient Bone Fantasy Knife is like a portal between worlds - traveling seamlessly between the realm of fantasy knives and real-world tools. 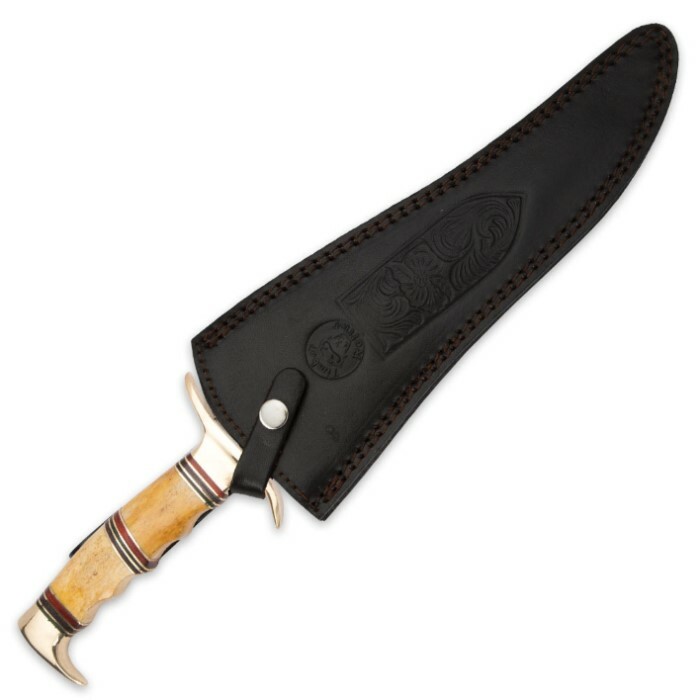 With its stout, seriously potent 10 5/8" stainless steel blade, the Ancient Bone can cleave thick rope, hack through woody branches and tackle countless everyday cutting tasks. It's also easy to transport through thick forests, impenetrable brush and other challenging real-world environments, thanks to the included rugged leather belt sheath. Wield the Ancient Bone once, and it's immediately clear - this is no false edged fantasy blade, best relegated to a shelf or display case. That's not to say the Ancient Bone isn't perfect for showing off, however. Its unique blade profile evokes flames, lightning or perhaps even a radiant energy beam, emanating from some fantastic mystical force. In a smart, seemingly paradoxical mashup, the handle employs traditional knife materials to comprise its imaginative, mythically inspired form. Satiny slick genuine bone beams with shades of cream, amber, beige and caramel, offset with flecks of black and gray that make up the bone's natural grain. Garnet, emerald and charcoal hued wooden spacers add a rousing splash of color that beautifully complements the regal polished brass guard and pommel. Delicately carved to match the contours of the human hand, the ergonomic handle makes wielding the Ancient Bone a delightfully gratifying experience, all its own. There's no question, Timber Rattler's Ancient Bone Fantasy Knife is truly mesmerizing - a veritable feast for the senses. But don't forget - this compelling knife is also a capable tool that blurs the line that divides "fantasy" from "real-world" cutlery. Order the Ancient Bone today, and explore both realms for yourself!